Share Our Campaign. Not ready to donate yet? Spread the word. Hey Flames Nation: Want more MADNESS? 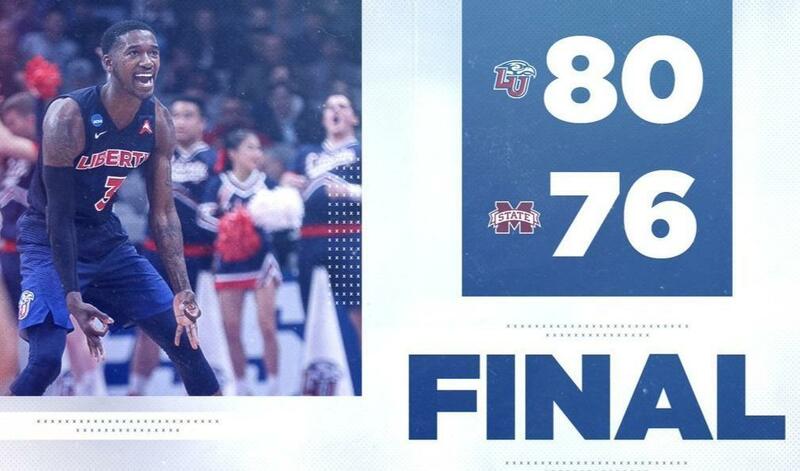 Support Liberty Men's Basketball as they continue in the 2019 NCAA Men's Basketball Championship and are set to play on Sunday, March 24 in the Second Round. Join the Flames Club to support the team and keep the Flames burning! Thanks to all our supporters for donating to the Liberty Men's Basketball Excellence Fund. BEST REGULAR SEASON RECORD IN PROGRAM HISTORY. ASUN CONFERENCE REGULAR SEASON CHAMPIONS. ASUN CONFERENCE TOURNAMENT CHAMPIONS. FIRST EVER PROGRAM WIN IN THE NCAA TOURNAMENT. The Flames Club mission is to raise financial support for Liberty University Athletics and to ensure that our coaches and student-athletes have everything they need to compete at a championship level. With the ever-increasing cost of competing at the NCAA Division I level, a dynamic booster club is critical to putting the strongest possible teams on the field, court, track, course, and in the pool.